If you are the victim of a truck accident, you need accurate and reliable information about what caused the crash and who is liable. Unfortunately, there are many myths out there about commercial truck crashes and if you believe them, you could misunderstand your legal options and miss out on money you deserve in settlement of your claim. Here, we explain why these common myths are simply not true. Myth #1: Truck wrecks are as dangerous for the truck drivers as they are for other drivers. The fact is that truck drivers are much better protected in the larger and heavier big-rig truck than occupants of passenger vehicles. People in passenger vehicles are more likely to suffer serious injuries, such as back and spinal injuries, paralysis, traumatic brain injury and other brain injuries, and internal organ damage than the trucker. They are also more likely to be killed. Myth #2: Truckers are too experienced to cause wrecks. Truck drivers are required to obtain a commercial driver’s license and to get a little more training than a non-commercial driver. However, driving a truck takes much more skill, training, and experience to navigate even simple maneuvers like turns. In the rush to get goods delivered, trucking companies often allow inexperienced and unqualified truck drivers to drive, with you and your family paying the price if you are seriously injured in a preventable truck accident. Myth #3: Trucking companies are not liable. Do not let the trucking company convince you that it is not liable for its negligent truck driver’s actions. In Texas, a trucking company is vicariously liable if the trucker was employed by the company at the time of the crash. In addition, you may have a separate claim against the trucking company for negligent hiring, negligent maintenance, violations of federal regulations governing trucking companies, and more. Myth #4: You can rely on the insurance company to fairly compensate you. Believing this myth could lead you to accept a settlement for far less than what your claim is worth. The insurance adjuster works for the insurance company and has a duty to investigate your claim and raise issues when possible to reduce or deny your claim. Especially if you suffer serious injuries, the value of your claim could be greater, which could mean that you will need to fight longer or harder to obtain the compensation that you are owed. 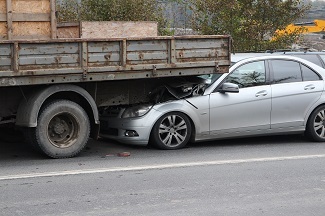 You should not settle your claim without first consulting with an experienced truck wreck attorney to be certain that your legal rights are protected. It is never too early to retain an attorney. If you suffered injuries in a truck accident case you need to speak with an experienced truck crash attorney as soon as possible. Contact us online or call us directly at 817.380.4888 to schedule your free consultation to discuss how filing a claim works and the compensation that you could deserve when you settle your claim. We help injured victims throughout Texas including Arlington, North Richland, Grapevine, Bedford, Hurst, Euless, Irving and all points in between.